Great For Veterinarian and Dog related Advertising! Put together your bag design. 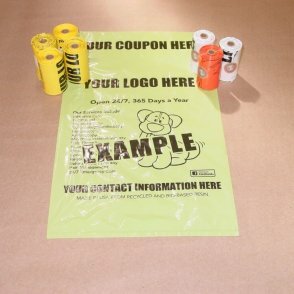 The bags are 8″ wide x 11.875″ tall. Email us your design or logo and we will contact you to work through the details. Have an idea for a design but need it put together? We can help. Just send us the design pieces. Once the design is completed we create a proof. The proof is sent to you for revison or approval. Once you approve the proof, we have the printing plate made. Decide the color for your bags. White, beige, black, yellow, medium blue and lime green bags are always available. In stock ink colors include white, black, and royal blue. Need a different bag color or custom PMS ink color? We may be able to provide it, just ask. Small Roll custom printed dog waste bags come with 15 bags on a roll and are made to fit all the major clip-on-the-leash dispensers. Bags are Made in USA for speedy order fulfillment and high quality. Complete process usually takes less than 3 weeks. If you need a faster fulfillment time, ask. Rush orders may be possible. Please note these bags-on-a-roll are the style of bags typically used in the clip-on-the-leash dispenser. All first time orders require a $100.00 fee for the printing plate. This is a one-time fee. The printing plate can also be used for future orders at no added cost. 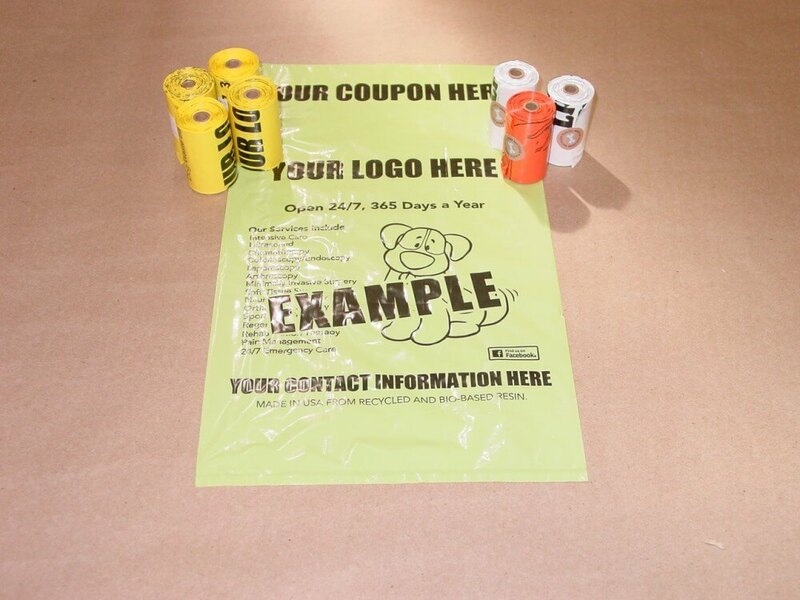 In addition to the printing plate, you have the cost of the dog waste bags….. Contact us at bio-buddy@wimancorp.com or call us at 800-694-0017, to get the design process started. PROTECTING OUR ENVIRONMENT WITH EACH POOP PICKUP!